Today is Halloween. While I resolutely avoid anything that smells like evil—demons, mediums, and the like—I’ve always enjoyed the idea of firing up my imagination and dressing up as something fun and interesting. 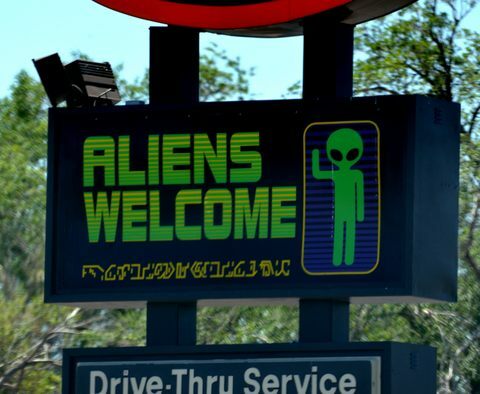 Last summer Pete and I drove through Roswell, New Mexico—probably the universe’s most famous destination for extraterrestrials on vacation. 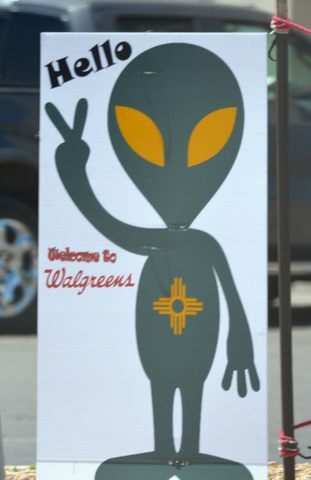 If the signs around town are any indication, aliens are certainly welcome there! It occurred to me that if aliens want to visit earth, the best time to do it would be on Halloween. Think of all the complements they’d get on their costumes! What do aliens look like? 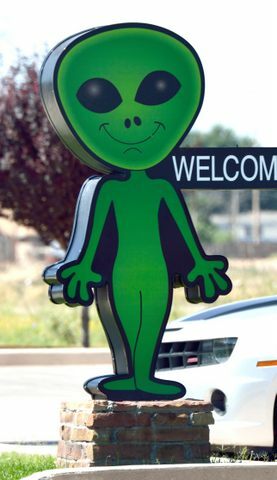 With all the media promotion, I bet we all come up with the same mental image: Little Green (or gray) Men with small, slender bodies, big heads and eyes, and a tiny mouth, perhaps standing next to a flying saucer… as in the photo above. 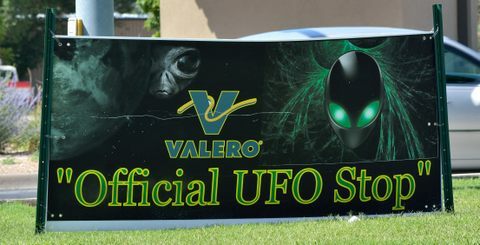 While Pete and I skipped Roswell’s International UFO Museum and Research Center, we quickly found that you don’t need to pay to see aliens. As we drove up and down the town’s main street, they were everywhere we looked! 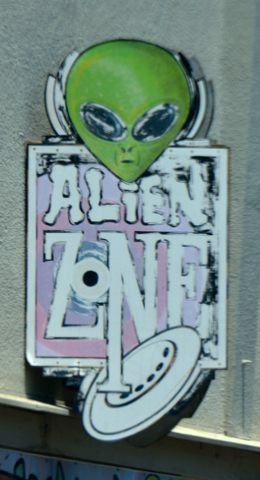 Aliens were featured on store signs and billboards, in shop windows, hanging out at gas stations and on street corners. As I pointed my camera and clicked away, I half expected them to pull out their own cameras to take pictures of us earthlings. Let’s look at Roswell. There are dozens of websites all proclaiming that the Roswell incident really did involve a UFO of non-terrestrial origin, plus alien bodies that were dissected. The evidence comes from interviews with “eye witnesses.” “History of the Roswell UFO Incident,” at howstuffworks.com is a good example. I also came across an impressively research article debunking these testimonies: What Really Happened at Roswell, by Kal K. Korff. I’ll let you draw your own conclusions. Finally, on a serious note, what do UFOs and aliens encounters have to do with faith in Jesus? To get into that topic would require a book! In fact, there is an excellent book on just this topic by Hugh Ross, Kenneth Samples and Mark Clark: Lights in the Sky & Little Green Men: A Rational Christian Look at UFOs and Extraterrestrials. And if you don’t have time to read a book, here’s a (rather lengthy) article that draws the same conclusions: “UFOs and the Christian Worldview,” by Jefferson Scott. 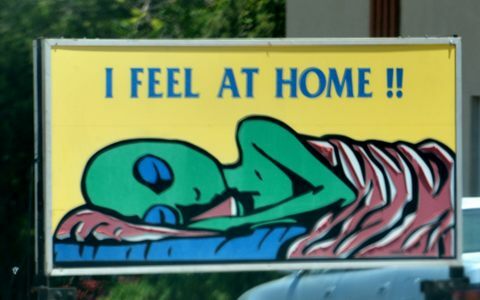 Both Ross, et.al,, and Scott present convincing evidence of a connection between alien sightings and abductions and the occult. I believe they’re correct. 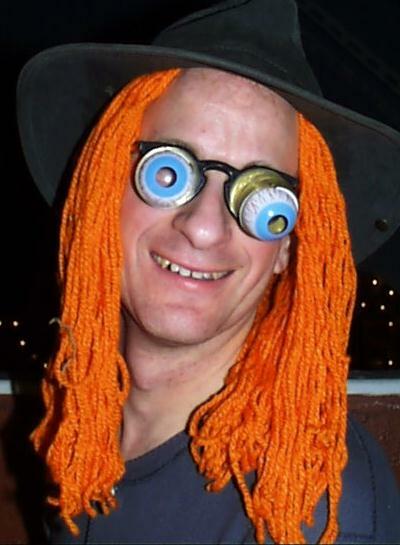 With that thought in mind, maybe I’ll decide on something else when it comes to a Halloween costume. This entry was posted in Fifth Friday Fun, Fun, Random and tagged alien, Bible, demons, Fun, God, halloween, real, UFO. Bookmark the permalink.